"Stimulus” is always sold to the public as a sound economic principle based on the Keynesian theory that government should spend during slow periods of the business cycle to smooth out the bumps in an otherwise cyclical economy. The concept is essentially that if the government spends money, people make income and with that income spend money they wouldn’t have otherwise had, thereby funding other people’s employment and on and on, regardless of where the government puts the money. However, politicians long ago learned that an easy way to win votes is to indirectly buy votes. Using John Maynard Keynes’ theory as their authority, “stimulus” is now a commonly accepted practice. President George W. Bush’s “Economic Stimulus Act of 2008,” spent $152 billion of tax payer money. That was followed up in 2009 with Barack Obama opening his Presidency with “The American Recovery and Reinvestment Act which has spent $816.3 billion of tax payer funds since its inception. 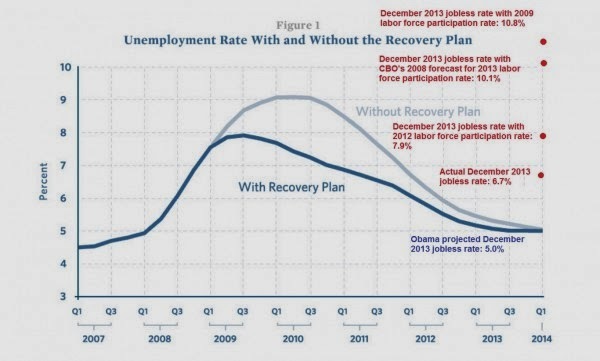 All of these so-called stimulus plans, like most politically-driven plans, always promise great results. However, rarely do they perform as expected, leading to a changing political narrative. In the case of the Recovery Act, early negative indicators led to the talking point of essentially, "had the law not been passed, the economy would have been even worse off!" This is obviously a claim difficult to prove or disprove without a baseline of some sort. In President Obama’s case, he deserves credit for allowing his economic team to create an actual baseline resulting in a great opportunity for Americans to see that stimulus does not work. The chart below was created by the President's economic team and was one of the major selling points used to promote his stimulus bill. James Pethokoukis of AEI added the data points in red on the right side of the chart, demonstrating what has happened to employment based on differing assumptions. Regardless of the assumption, every single data point demonstrates that the country is worse off than the President's team predicted the country would be had the administration and Congress taken no action. Today the administration claims credit for from 3.5 million-8.5 million jobs saved or created (these are all estimates as a "saved" job can't really be counted). Let's take these numbers on face value and consider the return on investment (ROI) for the $816.3 billion already spent. This amounts to $96,035-$233,229 per job. Now if you calculate the ROI using the GDP per capita in the US of $51,700, you'll see the ROI is from -46% to -78%! This is a typical result of a government program because government simply does not spend money as well as the private sector. A few examples often seen as most egregious from the Recovery Act include: "$783,000 spent on a study of why young people consume malt liquor and marijuana. $92,000 to the Army Corps of Engineers for costumes for mascots like Bobber the Water Safety Dog. $219,000 funding a study of college 'hookups.'" The idea that any government spending will result in economic growth greater than what the private sector can provide is simply ludicrous. The broken window fallacy is a excellent example. The basis of stimulus, Keynesian theory, would say a broken window is a net positive to the economy because economic output will increase as someone will be hired to fix the window and another will be hired to make a new window. Thus, the economy grows. However, what is missing in this argument is what would have otherwise been done with the money? Surely, everyone who has had to spend hundreds or thousands of dollars repairing damage from this current harsh winter could have used the money in far more efficient ways. Assuming any spending is good is simply bad policy. Further, taking the money either now in taxes or as future taxes through debt from the more efficient private sector makes us all worse off. Unfortunately, both parties would rather "spread the money around" to help themselves get reelected rather than do what is best for our country. I think the baseline argument is a bit bogus. In one breath you're saying that Obama's Economics team was so good that they were able to peer into the future and accurately predict how the economy would perform without stimulus. In the next breath you talk about how the stimulus completely failed. Obama's economic team can't be both wizards of economics and completely incompetent at the same time. For comparisons sake, I think it's better to look at how countries that engaged in stimulus fared vs. those that didn't engage in stimulus. Of course that tells a very different story. The EU decided to go the austerity route during this crisis, and they double dipped. Some EU countries are even running unemployment rates that are worse than the Great Depression. Meanwhile countries that engaged in Stimulus have fared much better. I think what really happened is Obama's team just misunderstood the magnitude of the financial crisis, and that's what led to their prediction being so far off. © NonPartyPolitics.com Reproduction of any content without proper citation prohibited. Simple theme. Powered by Blogger.